Buttermilk you say, why buttermilk? Many people have asked do I have any goats milk soap and my answer has been no. But I do have buttermilk in some soaps. This one and my Oatmeal Milk & Honey Soap. But why buttermilk? My parents are from Germany making me first generation. I grew up with my Father always drinking buttermilk and this reminds me of him which is why I chose it. It is a thick milk and had allot of butterfat in it and makes a rich creamy lather. Earthy Patchouli and Sweet Orange create a refreshing scent in this soap. If you thought you did not like Patchouli -try this one! 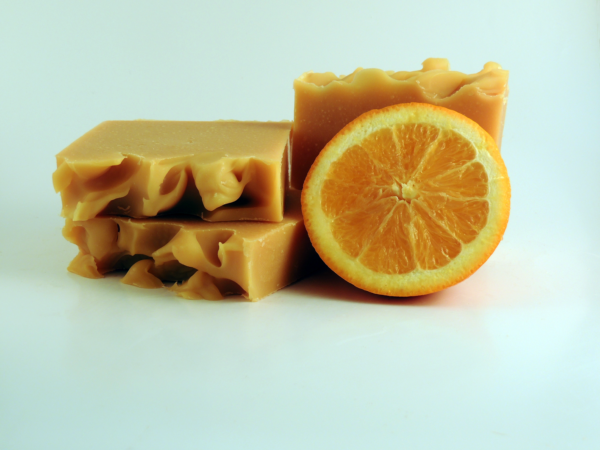 The Orange brightens the rich scent of Patchouli so you will fall in love with it again. This is one of my favorite scents which I am sure you will enjoy! Ingredients: Saponified oils & butters of Olive, Coconut, Cocoa & Shea Butters, Avocado Oil, Orange and Patchouli Essential Oils and Buttermilk. Castor & Meadowfoam Oils for extra moisturizing. Orange is uplifting oil, often called a happy oil as it lifts the spirits. It bursts with joy and vitality and happiness as an orange bursts with sweet juice. Patchouli, a very earthy and grounding scent .